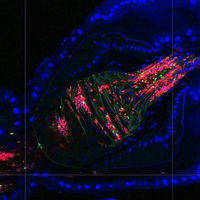 The coordinated movements of two chambers within the gland of a species of bombardier beetles (Brachinus elongatulus) allow the insects to effortlessly spray rapid pulses of noxious irritants, according to a study published today (May 1) in Science. The hundreds of species of bombardier beetle are named for their defense mechanism, which involves shooting a boiling stream of toxic p-benzoquinones at up to 10 meters (33 feet) per second from a gland in their rear. Inside the beetles’ bodies, the gland consists of two chambers separated by a valve. One is a flexible reservoir containing the raw materials to make the explosive compounds, while the reaction chamber, reinforced with chitin and waxes, contains the enzymes that turn the chemicals into a toxic weapon. 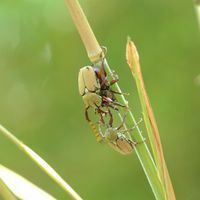 When a stressed beetle turns on its defenses, it squeezes the muscles of the reservoir to open the valve and mix the components together. 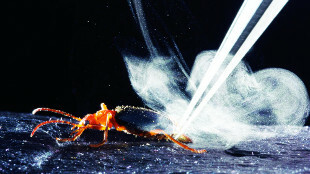 In the Brachinini group of bombardier beetles, to which the Arizona-dwelling B. elongatulus belongs, the spray then erupts in a series of 300 to 700 pulses per second, but it was not known how these pulses were controlled. In the latest study, researchers from MIT, the University of Arizona, and Brookhaven National Laboratory anesthetized 500 beetles by chilling them and then used modeling clay to keep them still in a synchrotron X-ray machine. 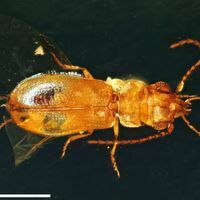 As the beetles woke up, they released their chemical weapon, and the scientists captured X-ray images of the process at up to 2,000 frames per second. In the video of 30 blasts in 14 individuals, the initial muscle contraction releases tiny droplets of chemicals from the reservoir into the reaction chamber. As the explosive chemicals form, water in the chamber boils, creating vapor pressure that closes the valve between the two chambers and expels the toxic substances out of the beetle’s body at high speed. The pulses are thus controlled by the pressure-driven opening and closing of the valve, not by the beetle’s muscles.